Explore a different neighborhood every night! We'll use Durgin Park as the restaurant where folks arriving on Sunday can gather. It has long tables, the first people there should argue with the wait staff (they are famous for their sass) to get a spot where a lot more people can join. It closes at 9:00, but there are bars and night spots in the neighborhood where the party can move too. Keep an eye on the #ploneconf2016 hashtag and the @ploneconf Twitter account for late breaking news. Durgin Park is a Boston institution. 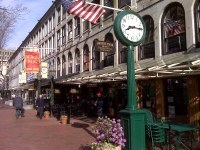 Quincy Market, where it is located (in the North Market building), was Boston's major produce and meat market from 1826 to the early 1970's when it fell into disrepair and underwent a major restoration. Legend has it that butchers in the market would bring their own chop and have it cooked to order. Those days are gone, but it's still a very meat-centric place with such New England staples as boiled dinners, baked beans, and chowders. The first thing you should know about eating at Durgin Park is that its forte is meat, not seafood, and the prime rib is especially famous. 40 years ago the slice was so large it draped over the edge of the plate. They've dialed it back since then but it's still big enough for 2 meals. (Many people take the leftovers home to eat later.) The second thing you should know is that they have the best Indian pudding in the world. You've probably never heard of Indian pudding - it's a traditional New England corn meal and molasses concoction and you should definitely try it. Get it with vanilla ice cream. Home of Harvard University, take a stroll through Harvard Yard before hitting the restaurants and bars. Here are some good ones. Boston's Italian neighborhood - Old North Church and the Paul Revere statue are here ("one if by land, two if by sea"). There are lots and lots of tourists but it's fun anyway. Here are some notable spots. See the party page for more details. If you want to go someplace before or after, here are some suggestions. This area has gone from grunge to major attraction in the last dozen years and there are some notable restaurants. A bit more spread out, but a mother lode of good restaurants. You've already explored it at lunchtime but it's got good dinner options too - and it's close to the sprints. Explore the Broad Canal or take a walk along the Charles River if you haven't already. If you are sightseeing in Boston and need a good lunch spot, consider the Shake Shack on Newbury Street, it's a classic. Oh, and there's a Burdick's Chocolates just a few blocks away on Clarendon. Citizen Public House and Oyster Bar on Boylston Street near Landmark Center and Fenway is known for whiskies, bourbon, micro-brews and whole roast suckling pig as well as oysters (although not as many kinds as Hops Test Kitchen). Late night spot.